Comfort Food. 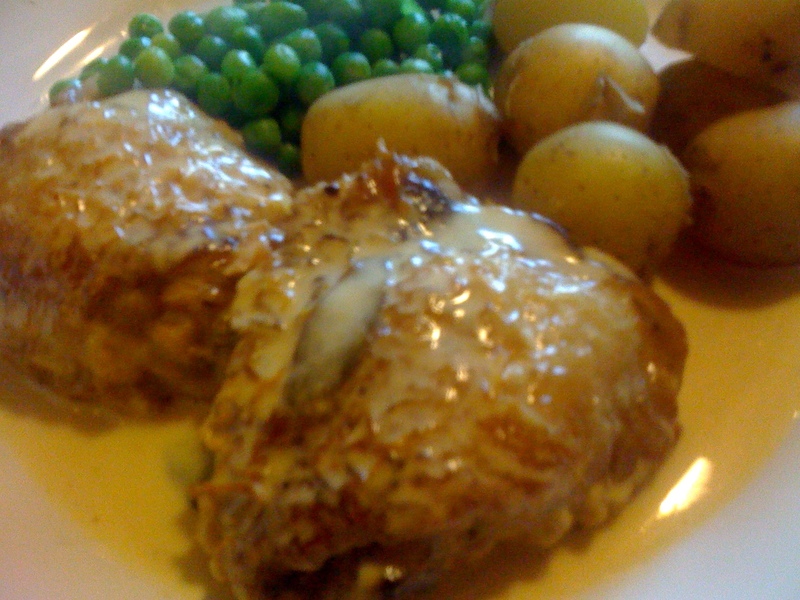 Chicken with sage, white wine & cream sauce. It has not been the weekend I was expecting. I got in at 4am on Saturday morning after a long night of curry and carousing, to find Mr Greedy puffy and hot, coughing in his sleep with red swollen eye sockets. Because I was quite drunk and very tired I simply collapsed into bed and allowed him to deal with Greedyboy when he woke up at 5.30. Yes, I am that considerate. But you can’t look after a kid when you’re still drunk and looking after a kid whilst you’re just ill is perfectly possible. Trufax. I know this because I have had to do it on countless occasions. All the same, poor Mr Greedy. As a result of this, neither were up to doing much the next day, and neither of us really wanted the birthday dinner that we had booked for the same evening, although I do think, to Mr Greedy’s eternal credit, he still would have taken me had I really wanted to go. No; dinner called for comfort, soothing and demanded to be eaten on the sofa, watching ‘Men Who Stare At Goats’, followed by a very early night. I feel I was taking a bit of a risk, making a rich sauce to go with the chicken, given our tender states, but it worked well. In a heavy based pan, heat the oil over a medium-high flame and put in the chicken thighs, skin side down. Put the sage leaves on top top the chicken pieces. Leave the chicken where it is for at least 5 minutes, until the skin has had a chance to brown and crispen – if you start moving it around before this point, not only will the skin tear and stick, but it is unlikely to brown properly, leaving you with limp greasy skin, and that will not do at all. When you are satisfied the skin is browned and crispy, you turn the chicken pieces over in the pan, the sage leaves should fall to the bottom, and put the lid on. Turn down the heat a smidge and cook the chicken for 10-15 minutes, until the bottom of the chicken is brown, and when pierced with a knife the juices run clear. If your thighs are big and meaty, bank on at least 20. Remove the chicken to a warm plate or serving dish and drain off the majority of the fat that will be left in the pan, reserving the sage leaves. Pour in your wine and deglaze the pan with it, scraping up all the chickeny bits with it and let it bubble away for a couple of minutes until it begins to reduce. Now pour in your cream, and stir well. The cream will reduce quickly, so do keep an eye on it. Season with salt and pepper, and when you have a nice thick sauce, put your chicken back in and heat it back through with the sauce for a moment or two. And serve, with a green veg and whatever carb you’ve got to hand.